Another holiday approaching means another name puzzle on the blog! I will do a round up once I have finished my first year of blogging with all of our name puzzles – like this Christmas tree one, and the Halloween pumpkin. For our Easter name puzzle I took some inspiration from Hands on as we Grow. A month or so ago Jamie posted a neat Rainbow Name Puzzle. 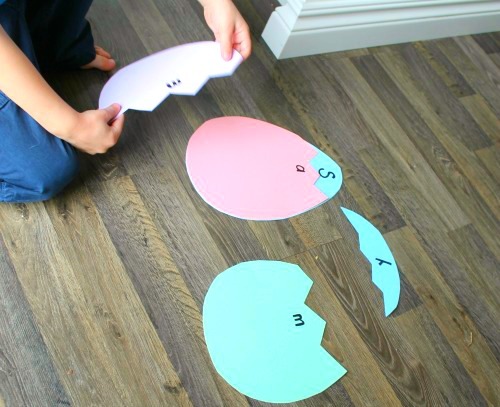 This Easter Name puzzle is along the same lines – and full of fun and learning! 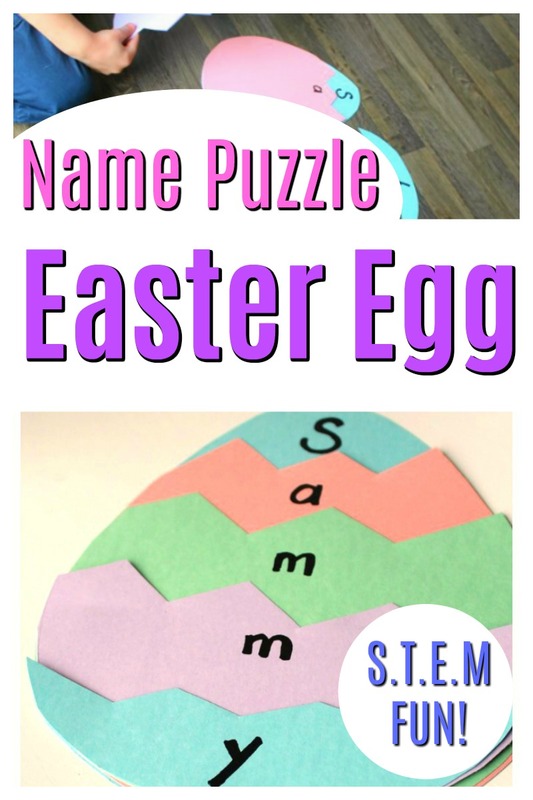 Sammy loves puzzles, so I made this Easter egg name puzzle sort of like a nesting puzzle. It was very simple to make and little ones could quite easily make their own. Next, cut a zigzag line near the top of one of the eggs. Then cut a zigzag line a little further down on the next egg. And so on. Finally, print the letters of the name onto the Easter egg. I actually made this egg for Sam (as if that wasn’t clear from the resulting name puzzle – definitely not made by a 3.5 year old!) I was playing around with the idea of how I thought it would work during his rest time. I have found it best to do trial and error activities on my own before involving the babes. Sam hasn’t yet made one on his own, though he is ready to do so later today. I’m interested to know how he will do with creating it – lots of learning and skill involved with this activity. Sam did enjoy putting the name puzzle together, and this time we did not glue it down so it can be played again and again. It is a neat way to do a name puzzle as there are many different things little ones can look at to decide which piece goes where. Obviously the letters, but also the size of the pieces. This would be a great puzzle for learning to spell unfamiliar names or words because of this. 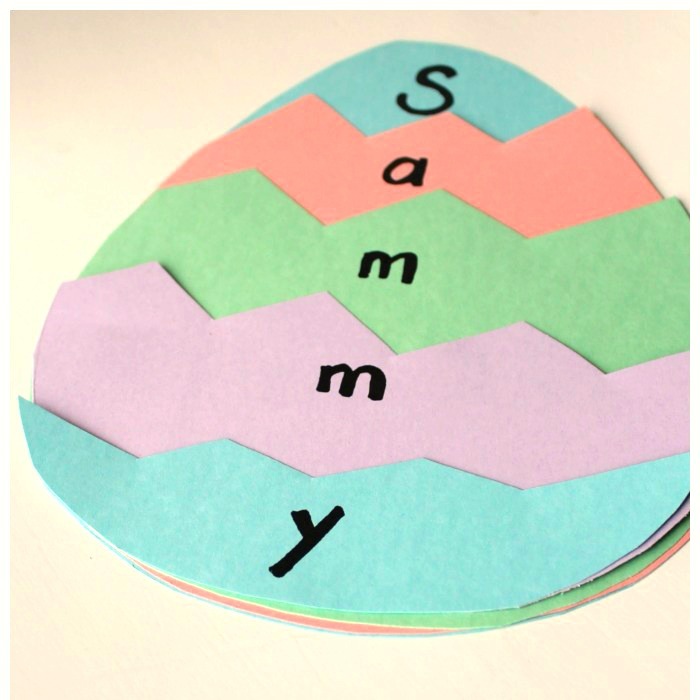 A fun way to add a little bit of an Easter twist into learning a name! I love that this Easter activity also incorporates STEM learning. STEM stands for Science, Technology, Engineering, and Math. This activity really gets preschoolers thinking about shapes and sizes and how they all fit together! 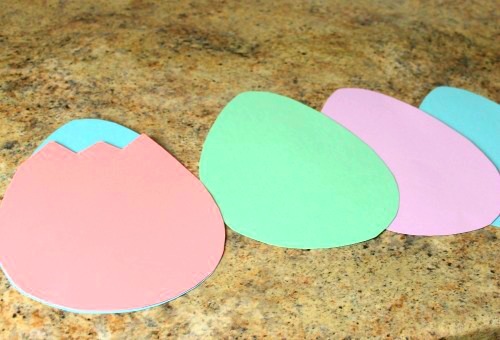 I hope you like this Easter activity for preschoolers friends! « Seed Art Ideas for Kids! I can’t wait to make this with my granddaughter. Looks very easy. Super easy Barb! And tons of fun. Hope you and your little one enjoy!